Home » News » How Does Solar Water Pump Work? How Does Solar Water Pump Work? What is a Solar Water Pump? Solar Water Pump are devices made to pump small amounts of water using the energy of the sun. For rural locations that are not part of the local electricity grid, solar pumps offer a clean and simple alternative to fuel-burning generators and windmills. They require no fuel deliveries, and very little maintenance. As you may now there are different kinds of solar powerd water pumps, depending on purpose. In this article we explain the different types as well as the components included in a solar water pumping system. Solar pumps come in two major varieties. Surface pumps include pressure, delivery, and booster pumps. Delivery pumps move water from one location to another. Some pumps handle high water pressures but most are intended for moving large volumes of water at low pressures. An example of this type of pumping would be on a farm where water needs to be moved from a cistern or lake to water tanks on the farm. Another typical application of a delivery pump is supplying water to an RV or camping trailer. Submersible pumps are primarily used for well pumping. Such pumps fit inside the well casing in a drilled hole. 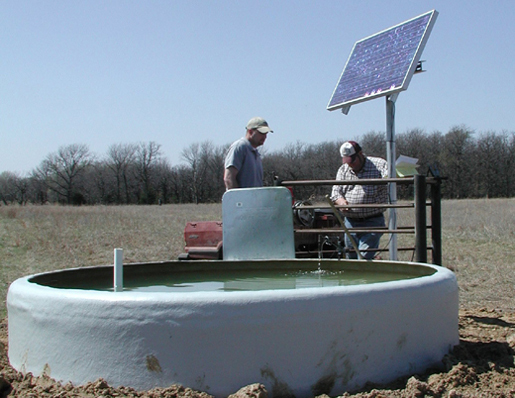 Some older wells drilled for windmills are less than 4″ (usually 2.25″), and solar submersible pumps will not fit. It is important to remember that the deeper the well, the more expensive the pumping system will be. The largest solar pumps currently available are 1/4 to 2 HP. Solar powered well pumps are not suited for pumping large amounts of water. Field irrigation is more efficient and less expensive if you have AC power available. A solar module can be mounted almost anywhere, but it should face in a southerly direction (for North America). If you are planning to use solar pumping on a farm or ranch the modules and pump controller should be mounted on a raised pole in order to remain above snow drifts and out of range from animals. Animals can cause significant damage if the pump or any of its components are mounted too low and in a place accessible to the animals. How Does Solar Water Pumping Work? 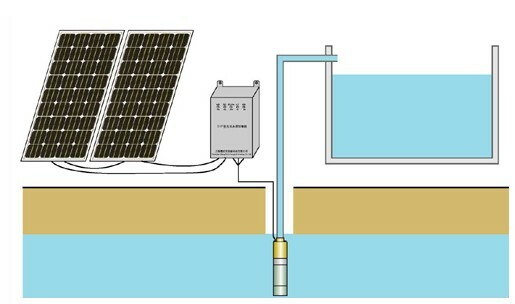 A solar-powered water pumping system is composed of several PV (photovoltaic) panels. Solar cells are the building block for solar panels. Each solar cell has two or more specially prepared layers of semiconducting material (generally silicon) that produce direct current (DC) electricity when exposed to sunlight. The DC current is collected by the wiring in the panel. The current is used to supply a DC pump, which pumps water whenever the sun shines, or the current is stored in batteries (for a battery-coupled pumping system) for later use by the pump. A solar-powered water system is fairly easy to install, especially if you decide that you do not need a battery-coupled solar water pump. In such case the system will work when the sun is shining and stop when it doesn’t. And when the sun shines and you do not use water, a tank is filled for later use. The below picture shows how a solar powered water pump works. If you are interested in trying to build your own solar powered water pump, I’d recommend starting with a small project and hands on guidance from a book. Since the system requires both piping and wiring, you should not try this unless you know what you are doing. You can also get simple a solar water pump kit, ready to set up. A popular one, is this solar fountain pump. If you have a garden, this is a great way to start understanding how a solar water pump works. bit up fast! What web host are you using? Can I am getting your affiliate link in your host? Hi to every one, it’s truly a fastidious for me to pay a quick visit this site, it contains helpful Information. website is actually fastidious and the visitors are really sharing fastidious thoughts. happen to be a great author.I will remember to bookmark your blog and may come back sometime soon. to me. Regardless, I’m definitely delighted I discovered it and I’ll be bookmarking it and checking back often! neatly-preferred than you may be now. You’re very intelligent. You understand therefore considerably in terms of this topic, made me in my opinion consider it from numerous varied angles. Woman gaga! Your individual stuffs great. Always deal with it up!